Today is International Chess Day, as proposed by UNESCO because the International Chess Federation (FIDE) was founded on this date in 1924. It has been celebrated on this date since 1966. 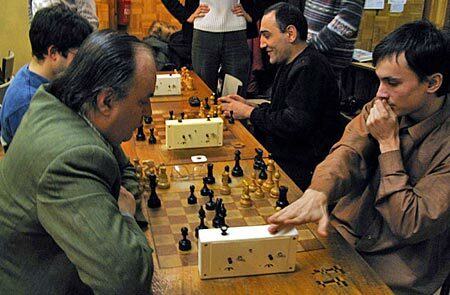 FIDE, which has 181 chess federations as its members, organizes chess events and competitions around the world on this day. A 2012 Yougov poll showed that “a surprisingly stable 70% of the adult population has played chess at some point during their lives.” The claim is that “the adult population” includes people “in countries as diverse as the US, UK, Germany, Russia, India.” I wouldn’t exactly call these countries “diverse” (with the possible exception of India) but I get the point. If the statistic holds true for my readership I don’t need to spend much time talking about how the modern game of chess works – not that I want to do that, anyway. Instead I’ll talk about some peripheral matters such as the historical antecedents to the game, its near and distant relatives, and some novel chess pieces. 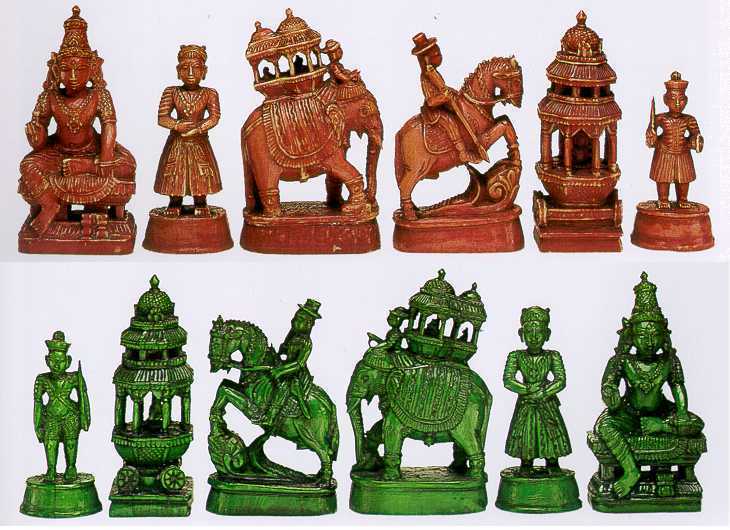 Chess as we know it is generally believed to have evolved in Eastern India, c. 280–550, in the Gupta Empire, where an early form (in the 6th century was known as chaturaṅga) (Sanskrit: चतुरङ्ग), literally “four [military] divisions” – infantry, cavalry, elephants, and chariotry, represented by the pieces that would evolve into the modern pawn, knight, bishop, and rook, respectively. From India the game spread eastward and westward along the Silk Road. The earliest physical evidence of a chess-like game (that is, actual game pieces) is found in the nearby Sassanid Persia around 600, where the game came to be known by the name chatrang. The oldest archaeological artifacts, believed to be actual chess pieces, were excavated in ancient Afrasiab (modern Samarkand), in Uzbekistan, and date to about 760, or possibly older. The oldest known chess manual was in Arabic and dates to 840–850, written by al-Adli ar-Rumi (800–870), a renowned Arab chess player, titled Kitab ash-shatranj (Book of Chess). The original manuscript is lost, but it is referenced in later works. The eastern migration of chess, into China and Southeast Asia, has even less documentation than its migration west. The first reference to chess, called Xiang Qi, in China comes in the xuán guaì lù (玄怪录, “record of the mysterious and strange”) dating to about 800. A few scholars contend that modern chess evolved from Xiang Qi (Chinese chess) or one of its predecessors, but this is not the majority opinion. Chess reached Western Europe and Russia by at least three routes, the earliest being in the 9th century. By the year 1000, it had spread throughout Europe. Chess was Introduced into the Iberian Peninsula by the Moors in the 10th century and is described in a famous 13th-century manuscript covering shatranj, backgammon, and dice entitled el libro de los juegos (the book of games). Around 1200, the rules of shatranj started to be modified in southern Europe, and around 1475, several major changes made the game essentially as it is known today. These modern rules for the basic moves had been adopted in Italy and Spain. 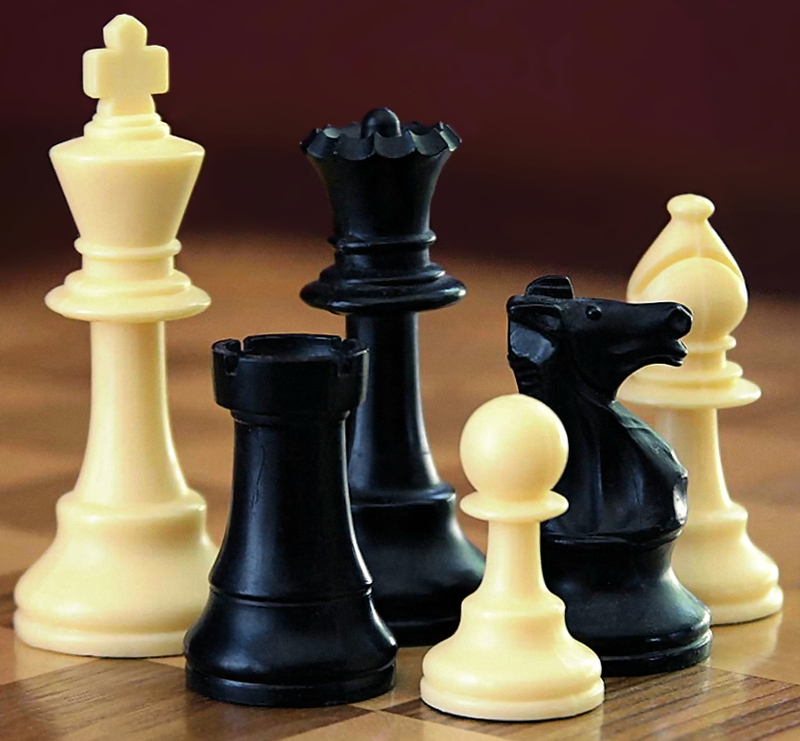 Pawns gained the option of advancing two squares on their first move, while bishops and queens acquired their modern abilities. The queen replaced the earlier vizier chess piece towards the end of the 10th century and by the 15th century had become the most powerful piece; consequently modern chess was referred to as “Queen’s Chess” or “Mad Queen Chess.” Castling was also introduced, derived from the “kings leap” usually in combination with a pawn or rook move to bring the king to safety. These new rules quickly spread throughout western Europe. 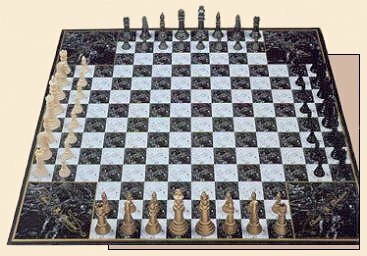 The rules concerning stalemate (a draw when the king cannot move safely) were finalized in the early 19th century. Also in the 19th century, the convention that White moves first was established (formerly either White or Black could move first depending on chance). Finally, the rules concerning castling were standardized – variations in the castling rules had persisted in Italy until the late 19th century. The resulting standard game is sometimes referred to as Western chess or international chess, particularly in Asia where other games of the chess family such as xiangqi are still prevalent. Since the 19th century, the only rule changes have been technical in nature, for example establishing the correct procedure for claiming a draw by repetition. The increased interest in the game of chess, particularly in international play during the late 18th century and early 19th century, brought about a renewed demand for a more universal model for chess pieces. The variety and styles of the conventional form, begun in the 15th century, had expanded tremendously by the beginning of the 19th century. Conventional types popular during the period included the English Barleycorn chess set, the St. George chess set, the French Regence chess set (named after the Café de la Régence in Paris) and the central European. Most pieces were tall, easily tipped and cumbersome during play, but their major disadvantage was the similarity of the pieces within a set. A player’s unfamiliarity with an opponent’s set could alter the outcome of a game. 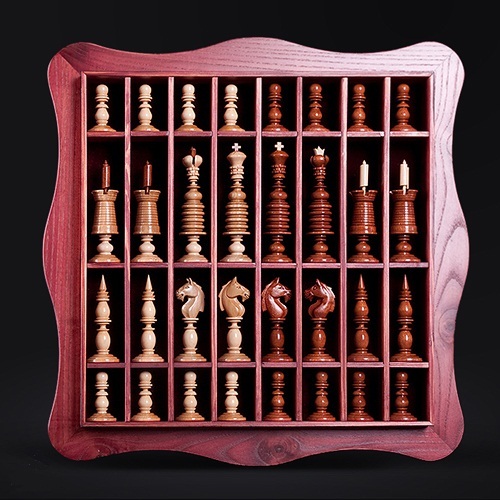 By the early decades of the 19th century, it was all too clear that there was a great need for a chess set with pieces that were easy to use and universally recognized by chess players of diverse backgrounds. The solution, first released in 1849 by the purveyors of fine games, John Jaques of London, sport and games manufacturers, of Hatton Garden, London England, was to become known as the Staunton chess set after Howard Staunton (1810–1874), the chess player and writer who was generally considered the strongest player in the world from 1843 to 1851. Although Nathaniel Cook has long been credited with the design, it may have been conceived by his brother-in-law and owner of the firm, John Jaques. A few variants of classic chess pop up now and again although they don’t have a lot of popularity. 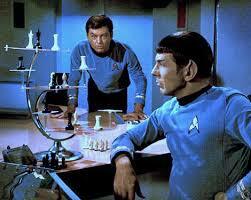 Three-dimensional chess has a certain following, notably among fans of the original Star Trek series where a fake version of the actual game was featured once in a while. There’s also four-handed chess which I’ve played a few times in college in my first year because one of my friends was a rabid fan of all manner of games and had groups of us up all night indulging his passion. Whatever we played he always won. 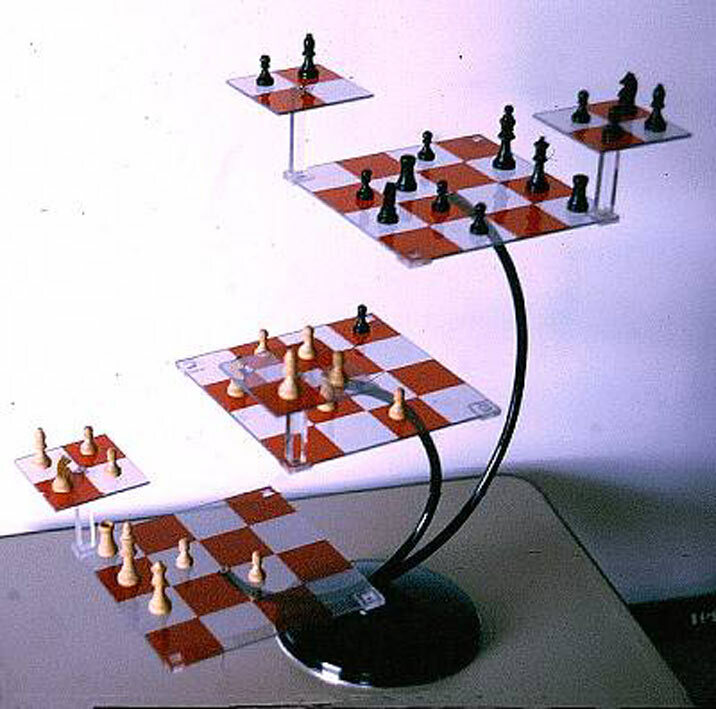 Four-handed chess is essentially all against all, but you can form temporary alliances. When one player’s king is placed in checkmate, that player’s pieces are frozen, but they can be freed by another player capturing or moving one of the pieces creating the checkmate. Xiangqi ( 象棋), known as “Chinese chess” in the West, is very popular in parts of China and the Chinese diaspora. When I lived in Hong Kong I constantly passed games in the street surrounded by crowds of men constantly and loudly voicing their opinions of moves to each other and to the players. The game represents a battle between two armies, with the object of capturing the enemy’s general (king). Distinctive features of xiangqi include the cannon (pao), which must jump to capture; a rule prohibiting the generals from facing each other directly; areas on the board called the river and palace, which restrict the movement of some pieces (but enhance that of others); and placement of the pieces on the intersections of the board lines, rather than within the squares. Preheat your oven to 425˚F/220˚C). In a large bowl (or stand mixer), cream together the butter, sugar and vanilla. 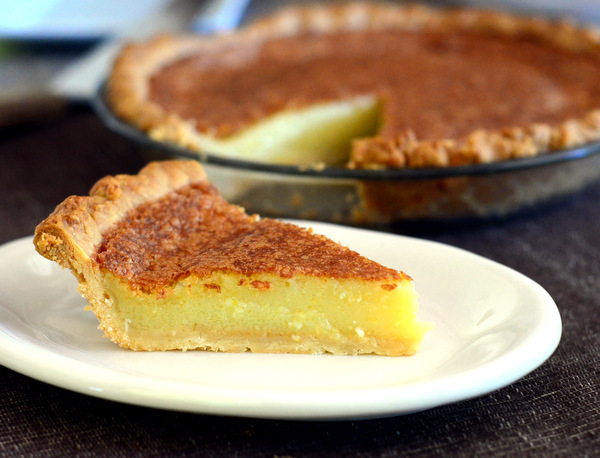 Mix in the eggs, then beat in the cornmeal, evaporated milk and vinegar until smooth. Pour the mixture into the pie shell and bake for 10 minutes in the preheated oven. Then reduce the heat to 300˚F/150˚C) and bake for another 40 minutes. Let cool on a wire rack. Serve slices cold with whipped cream.